The NineHertz grabbed the top position among Mobile App Development Companies in 2018. 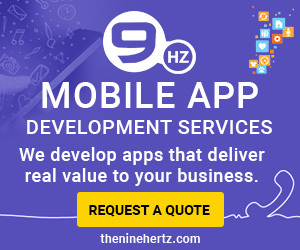 CINCINNATI, OHIO, UNITED STATES, July 10, 2018 /EINPresswire.com/ -- Yet again this year, The NineHertz holds a ranking in various categories and ranked among top Mobile App Development companies. Cincinnati, USA, July 10, 2018 (EINPresswire.com) -- The NineHertz continues to add success stories into the plethora of its achievements. Making it to the top in the Appfutura didn't come easy to the company, a lot of struggle, overtime, excellent innovations, and creativity make them achieve a position under top mobile app development companies. The NineHertz stands out in the market winning over the heart of their global clients and working on the latest and emerging technologies had led them to secure a position in the list in 2018. Appfutura is a renowned name in the globe, helping companies to find the best mobile and web development companies across the globe. They do a detailed analysis and research about a company before listing them on their list. A company has to go through a rigorous and complex analysis before grabbing a rank in the top mobile app development list. The parameters that are observed by the team of Appfutura includes reviews from clients, budget constraints, project complexity, new technologies incorporations, compatibility with various platforms, etc. The NineHertz is ranked among Top Mobile App Developer in 2018 across worldwide. 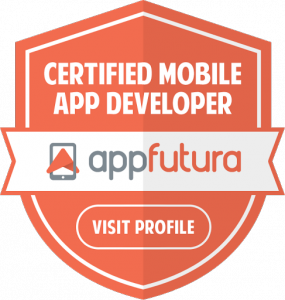 After a detailed analysis of our work and receiving a good review from multiple clients of our company, Appfutura listed us in Top Mobile App Development Companies. The team of Appfutura has selected the company on the basis of their performance in many sectors and their ability to provide the best solutions to their clients. They have been constantly serving their clients to provide innovative designs that satisfy the clients' needs and strengthen their market presence. If you are dealing in the mobile app development business and looking to hire a company to outsource your project or if you are a potential startup/entrepreneur then Appfutura is a perfect platform for you to look for the top mobile app development companies. All the companies that are listed in the Appfutura are trusted and verified companies. The company has a presence in more than 15+ countries and having operational units in USA, UAE, UK, India, and Australia. Having 9+ years in mobile app development domain, they have bonded with 1000+ trusted clients all over the world. They have a team of 200+ professionals and are expanding their team this year to 300+ professionals. The company deals in various domains including emerging technologies and the already existing technologies. They have vast experience in iOS and Android App Development. Also, they work in providing On-Demand Solutions, AI, AR, VR, Big Data, Industrial Solutions, Digital Marketing, Web Development, etc.